As the days get shorter and cooler, greenhouse plants need less and less water. If you go on giving them as much water as in summertime, problems will build up. Firstly, the plants may continue to grow soft young shoots that will be susceptible to frosts and disease, instead of slowing down their growth-rate and hardening up their stems for the winter. Secondly, the dampness caused by all the watering will encourage the fungus growth that causes leaf moulds and root rots. This is made worse by the lack of sun to dry off plant and soil surfaces quickly after watering. Thirdly, the excess water unused by the roots as it drains down through the soil dissolves essential plant nutrients out of the soil and carries them down beyond the roots’ reach. This process is called leaching (sometimes misspelled ‘leeching’, which is an entirely different thing). Fourthly, you are wasting water. What can you do? If you are using a watering computer set it to water less often, for example every fifth day instead of every third. The soil surface can dry off longer between waterings. You could also set it to run for a shorter time. Water in the early morning, so that leaves and soil can dry off before night, when humidity rises as the temperature falls. Instead of spraying with a hose use a can to apply water to the bases of plants without splashing their leaves and wetting the soil between them. Ventilate the greenhouse as often as you can. Check pot plants by touching the compost surface with a dry finger: if it is damp enough it will feel cool and compost particles will stick to your fingertip. Give little or no water until next time. In our wet climate we don’t realise how much water plants use until we get a glasshouse or tunnel, and have to provide all of it ourselves. What are the options? Watering-cans are accurate and economical with water but very laborious to use for more than a few plants. 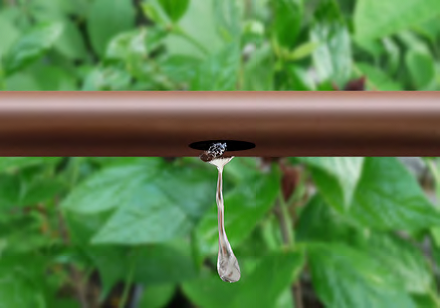 Hosepipes deliver more water but can splash mud and disease spores all over your plants. Controlling the jet of water with the tip of your finger or thumb is an acquired skill. 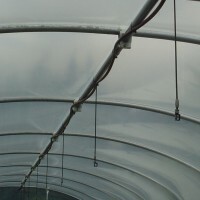 Polytunnels often have overhead spray-lines. They are effective, but spray everything below them whether it needs water or not, and if not hung perfectly level the lowest parts drip for ages after the flow is turned off. Seep-hose, laid around and between your plants and dripping water from its many holes, is efficient and effective but doesn’t work well with pots. Keep a watering-can for pots and trays and any additional spot-watering needed. If water charges are a problem, bury the seep-hose under the soil surface so less water is lost by evaporation. For convenience when you are away, add a battery-powered watering timer to water the plants every few days. It soon earns its cost in saved water and labour. Water plants in the morning if you can. This gives more time for wet leaves to dry off before evening, reducing the danger of Botrytis mould and other fungus problems that thrive in damp conditions. A good soaking is better than little-and-often. Soil temperature is more important than air temperature for plant growth. To avoid chilling pot-plants and seedlings with cold water, refill the watering-can when you finish watering: the water will be warmed up to ambient temperature by the time you need it. I just heard that it has been the windiest May on record since they started taking records. And even yet as i look out my office window i can see that the weather still has not really settled as much as one would expect for this time of year. Never the less, listening to the weather forecast this morning it appears that things might be looking up coming into next week. So why do i need to worry about my greenhouse if its windy outside. Well hear is a prime example. Before looking into getting a greenhouse remember to think carefully about its location, its use, and its strength. If you take glasshouses as an example to highlight the importance of this. Say a 6′ x 8′ aluminium finish with horticultural glass. It may cost between €500 and €650 depending on the brand. Sounds like a bargin, but normally glasshouses in this price range are designed for very sheltered gardens. 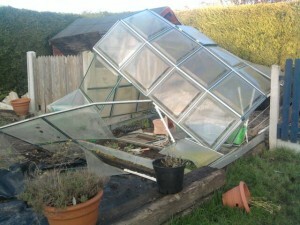 If its located in a windy garden, then it may end up like the glasshouse in the photo. Although it was a cheap buy, its an expensive loss. So shop around, view the products where possible and remember a cheap bargain is not always the best buy. 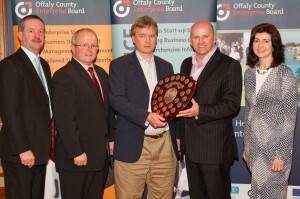 Polydome Greenhouses of Birr are the ‘Overall Winner’ of the Offaly County Enterprise Awards. Sean Gallagher of Dragon’s Den presented the award to Jonathan Pyle, Director of Polydome. The award recognises excellence in business generally and specifically the criteria judged included the business plan, marketing strength, financial strength, use of technology and innovation in the business as well as the entrepreneurial skills of the promoter. 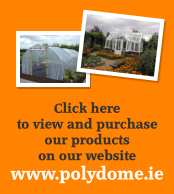 Polydome supply Glasshouses and Polytunnels in the 32 Counties and were first established in 1985. Their range includes Timber as well as Aluminium Glasshouses and they are one of the leading manufacturers of Polytunnels for Gardening Enthusiasts as well as Commercial Growers. The majority of vegetables are 80 to 95 percent water. So next time you look at your lovely vegetables in your tunnel or glasshouse think of them as little sacks of water, flavoured and full of vitamins. But remember, if the supply of water fails your vegetables yield and quality will suffer rapidly. In the high temperatures found in polytunnels and glasshouses it’s very important to irrigate on a regular basis and guarantee a reliable supply. The two most common methods of irrigation are overhead irrigation and ground level irrigation. Overhead is by far the simplest method. Water is released from sprinklers suspended from the roof of the tunnel or the glasshouse. These form a mist which saturates everything in the tunnel. Some draw backs of overhead irrigation: water is wasted as it not only falls on the beds and plants, but also the walkways through your greenhouse as well as work areas: sun spots are more likely to occur as the result of droplets forming on the foliage: and a large number of plants prefer being watered into the root as appose to directly onto the plant itself. Ground irrigation is a much more effective method. Lines of perforated pipe lay on top of the vegetables beds. Built in regulators in the perforated pipe leak out a set amount of water per hour. This allows even irrigation across the bed and more importantly directly into the root. However it does have its drawbacks also. More pipes + more fitting = higher costs. 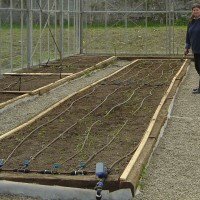 Also, as the pipes sit on top of the beds they sometimes can be in the way during weeding and planting. Don’t forget to automate your irrigation system if you’re away for long periods, therefore guaranteeing that your plants get their daily dose. Tap timers are a simple and effective solution. These can be gotten in many garden centres and DIY shops and are very easy to install. If you require further information feel free to visit our website. The picture on the left is of an overhead spray line. The picture on the right is drip irrigation.